How often do you think about your mattress? Or even your bed in general? This isn’t a lightly asked question. You spend a third of your life on mattresses—sleeping, reading, or otherwise relaxing. Sleeping, despite being one of the great mysteries of neurological and biological science, has been a universal human experience since its first steps. As such, beds and mattresses have had a long history of innovations, regressions, and curiosities leading to today. Here are 52 interesting and obscure facts about mattresses and beds that might have you rethinking your bed (but hopefully not keeping you up at night). 1) The word “mattress” is Arabic in origin. 2) The root word of mattress means “to throw something down,” referring to the practice of the time of sleeping on cushions on the floor. 3) The word “mattress” was most likely brought to Europe by Crusaders. .
4) Feather beds were first invented by the Romans during the last days of the Republic. Originally, Roman mattresses were filled with reeds, hay or wool. 5) One of the most important, earliest but least considered innovations in regards to mattresses was simply raising them off the floor. This greatly reduced the number of pests and rodents that would share sleeping spaces with their intended occupants. 6) South Asian and Indian mattresses use kapok—a tree whose seed pods can be spun into a cotton-like substance. 8) By United States federal law, all mattresses must be able to withstand an open flame for 30 seconds before catching. But we recommend you don’t test this yourself. 9) The queen sized mattress is the most popular size in America. It supplanted the twin sized mattress in 1999. 10) If you’ve ever been tempted to put your mattress on its side and use it like a giant domino, turns out you aren’t the first. In fact, there’s even a world record for the most mattress knocked over like dominoes: 1,001. 11) While the concept of a waterbed has been around since ancient times, it was revived in Scotland in the 19th century by Neil Arnott. 12) As a doctor, Arnott believed the waterbed mattress could help prevent invalid patients from developing pressure sores and ulcers. 13) Arnott deliberately never patented his idea so that doctors around the country and the world could use the waterbed mattress design to help their patients. However, only a few were ever made or used. 14) The modern waterbed only came to market in 1971, and hit its peak popularity in 1987. 15) The Romans can make a strong claim as the original inventors of the waterbed mattress. Their version consisted of being rocked to sleep by warm water before being carried to bed. Obviously, only the wealthy could do this. 16) Hans Christen Anderson, a prolific writer who wrote “The Little Mermaid”, also wrote “The Princess and the Pea” in 1835. The story famously uses mattresses as the principle plot mechanism for determining that the title character really is a princess. Apparently princesses are so sensitive they can feel a pea under twenty mattresses. No word as to how that makes sense. 17) Even though Anderson was Danish, he may have based his story on a Swedish folk tale. 18) If Anderson had written his story in 1857, the princess would have had a far easier time falling asleep. That year the first coil spring mattress was invented. 20) At least the princess didn’t have to deal with unwanted bedfellows. Using cast iron bed frames and cotton mattresses had come into vogue before the turn of the 19th century, which reduced the pests that would infest even the most royal of beds. 21) Heinrich Westphal, a native German, invented the innerspring mattress is 1871 but was never able to make a profit off the invention. 22) It wouldn’t be until the 1930’s that innerspring, upholstered mattresses would gain prominence in the North American market. 23) A symbol of the power of the monarch in France was that the king could lie down during parliament meetings while legislating. Everyone else had to sit, stand, or kneel. 24) Louis XIV was particularly fond of lying in bed. He owned 413 different ones. Even if he slept in a different one each night for a year, he’d still have 48 left over. 25) Mattresses, much like plumbing and concrete, were lost for many people after the fall of the Roman Empire. Middle Ages’ mattresses were essentially benches covered in furs or chests filled with moss. 26) The first mattresses after the Middle Ages were filled with straw or pea shucks and covered with velvet or silk. 27) The airbed would only be introduced to American markets in the 1980’s. 28) The proliferation of rubber manufacturing and production during World War II allowed foam rubber mattresses to rise in the 1950’s. 29) The largest bed on record was made in the Netherlands and is 86 ft. by 53 ft. That’s an area of 4558 square feet. 30) For context, one of the largest beds practically used by a person is owned by former NBA superstar Shaquille O’Neal. It’s 450 square feet. 31) A previous entry in the competition for largest bed included the Great Bed of Ware constructed in 1590 in England. At 110 square feet, it could comfortably fit 15 people. 32) In the running for most famous luxury bed is the Golden Bed, another English invention, so named for its gilded wood frame. Built in 1879, it’s only 39 square feet but intricately carved. 33) The first mention of a bed in a literary work is in Homer’s Odyssey. 34) Folding beds were first invented by the Ancient Greeks. There are actually pottery remains from that time depicting folding beds. 35) Beds that fold up into a wall are sometimes called Murphy beds after their inventor William Lawrence Murphy. He invented this in the year 1900 and patented the idea in 1908. 36) Murphy invented his singular bed design to help woo a woman in his one room apartment without inviting social stigma. 37) The horror film Death Bed: The Bed That Eats actually features a bed as the monster. Although made in the 1970’s, it has only recently received cult status. 38) The traditional mattress of Japan isn’t technically a mattress. The tatami is a flooring mat made of rice straw or compressed wood chips. At first exclusive to upper classes, it’s been available to everyone since the 1800s. 39) King Tut’s bed was made entirely of gold and ebony. While it’s certainly luxurious, it can’t have been comfortable. 40) It is illegal to purchase a mattress on Sundays in Washington. The original rationale of the law is unclear, and it doesn’t appear to be a rigorously enforced law. 41) The fitted sheet—the sheet that goes over the mattress and is the bane of many people’s existence—was first invented in 1958 by Berta Berman. It wouldn’t be until 1990 that Gisele Jubinville figured out how to get the sheet to grab the mattress. 42) The most expensive bed in world is a 1.6 million dollar magnetic hover board that floats on air. We’d like to know if it’s actually worth it. 44) When archeologists looked under a microscope at the 77,000 year old remains they found cape laurel tree leaves (Cryptocarya woodii). This was probably chosen because it had a better chance at protecting early humans from mosquitoes and other pests as it has several chemical compounds in it that can kill insects. 45) The archaeologists also examined that the bedding was burned. This was probably done to eliminate insect pests and lay down new bedding. 46) Mattresses used to rest on ropes in the 18th century. That’s where the saying “Sleep tight, don’t let the bed bugs bite” came from. People would have to tighten the ropes every so often so that the mattress wouldn’t sag. 47) In 17th Century England beds were made with wood frames, rope or leather supports, and bags of straw as mattresses. 48) The futon was originally invented in Japan, but Western futons are thicker and feature the folding frame. Japanese futons are usually placed on the floor. 49) Did you know your mattress can be recycled? Visit earth911.org to learn more. Some communities have drop off centers and others have a small pickup fee. 50) When William Shakespeare died he bequeathed his second best bed to his widow. His best bed went to his daughter. Obviously, your mattress is the result of hundreds of years of history and innovation across the world. It’s not a purchase to be made lightly—your comfort and relaxation are on the line! 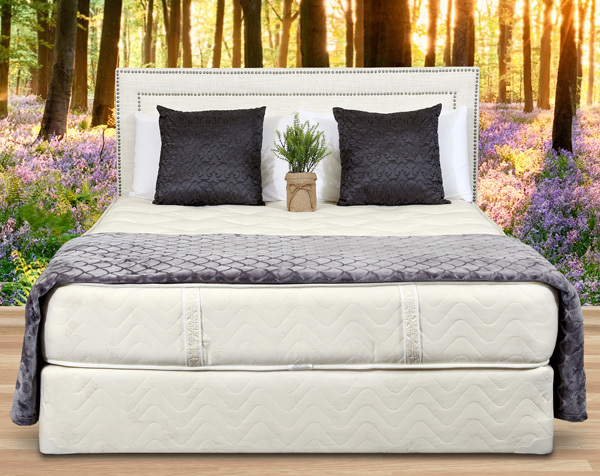 At Gardner Mattress, we take the time to personally work with you to find the mattress that best suits your needs and will ensure great sleep for years to come. Give us a call today or visit one of our showrooms to learn more! Next article	Can’t Sleep? Consider These 3 Natural Sleep Remedies!